n an unusually swift reaction, the Chinese government in Beijing has also claimed that the baby lama is indeed Chinese. Lin Hung, the young, handsome and popular Chinese appointed governor of Tibet has claimed he is the father and that he and the Dalai Lama have been having a clandestine affair for the past two years. Hung claims that the Dalai Lama has made numerous visits to their secret lovenest in Lhasa disguised as a Buddhist monk. Hong Kong (CNN) — When Shaun Rein drives to Shanghai’s Pudong International Airport, about 10 minutes outside the airfield, he begins to notice a line of cars — including Rolls Royces and Bentleys — parked along the side of the highway. “Why? It’s because these people, who can spend a million dollars on a car, don’t want to spend $2 on parking at the garage,” said Rein, managing director at China Market Research Group. For Chinese leaders, the nation’s newfound wealth represents a bumpy road as it tries to steer the nation on a new economic path. The ruling Communist Party (CCP) continues meetings this week for the 18th Party Congress, where it is expected to select Xi Jinping and Li Keqiang to become the president and premier, respectively, of China for the next decade. One of the great challenges the new leadership faces is to move the economy — currently driven by exports and investment — toward a more sustainable course led by domestic consumer spending. While domestic consumption is rising, it still makes up just over one-third of the China’s total economy. American consumers, by comparison, power more than two-thirds of the U.S. economy. 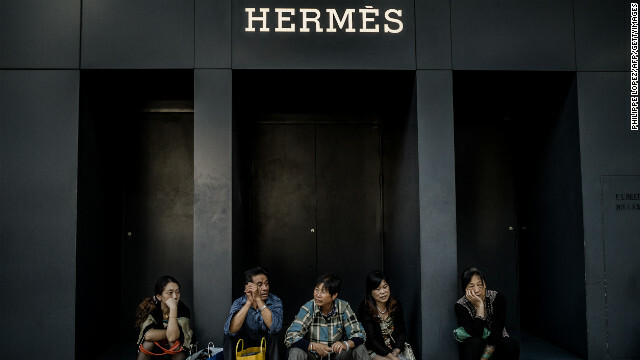 Much has been made of China’s growing group of super rich which has spurred record sales for luxury goods makers such as Chanel, Louis Vuitton and Prada. The nation has an estimated one million people with a net worth of $1 million or more, and that is expected to grow 2.5 times in the next three years, Rein said. But much of the hope of the rising domestic spending rests with China’s growing middle class. There are an estimated 350 million people in China’s middle class, which are households that earn between $6,000 and $15,000, Rein said. A government think tank predicted last week that by 2020 there will be 600 million Chinese earning middle-class incomes. “But they are not really middle class in the American sense. In the U.S., you’re born a blue collar worker, your parents were blue collar, your grandparents — and you’re proud of that, you have that identity. And you like to shop at Macy’s on special occasions,” Rein said. “In China, you don’t have that — that doesn’t really exist. Everyone here says they’re going to be rich,” he added. That growth represents eye-popping opportunities for foreign multinationals and domestic companies. Chinese consumers prefer overseas brands for consumer electronics yet favor domestic companies for personal care or household items, according to a recent report by McKinsey & Company. And foreign companies that got into the market early — such as General Motors — are now raking in record profits. But as outgoing President Hu Jintao noted last week, concerns remain. He set an ambitious target for 2020 to double per capita income in China from 2010 levels for both rural and urban dwellers to address the rising wealth disparity. China’s per capita income was $4,423 in 2010, according to the International Monetary Fund. “Unbalanced, uncoordinated and unsustainable development remains a big problem,” Hu said in his speech at the Party congress. “These are all things that the government is trying to address by reinstituting some semblance of a social safety net, so instead of saving 40 or 50% of their disposable incomes, people can start to spend it,” adds Gerth, who teaches at Merton College of the University of Oxford. For foreign companies, there are mounting worries of roadblocks from Beijing to prevent access to the growing Chinese domestic market. Last summer, a report from the European Union Chamber of Commerce showed that more than 40% of members said they think government policies for multinational companies are less fair than two years ago, and 22% say they may move investments out of the country as a result. Still, more cash is trickling down to Chinese laborers. More than half of the country’s growth last year “has come from domestic consumption, and it’s really because the government is pushing for more money to go into the pocket of everyday Chinese — 21 of China’s 31 provinces increased the minimum wage by 22%,” Rein said. via Will Chinese consumers lead the world? – CNN.com. TOMORROW an important election takes place abroad and, while the outcome is still unclear, it will have profound effects on Ireland’s prosperity and the prospects for world peace. The new president’s attitude to free trade and the use of military force in places far from his capital are critical. Fortunately, in his recent visit to Ireland the likely victor spoke glowingly of the relations between his country and ours. Strangely, however, the election has hardly been covered by the overseas media. The Chinese Communist Party (CCP) will begin to undergo a leadership transition in the 18th party congress. Some members of the politburo, the most powerful institution in China, will retire. Among them is the current general secretary and president Hu Jinto. 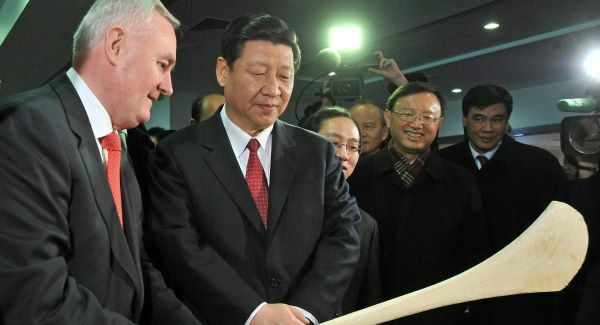 Hu is expected to be replaced by Xi Jinping, the current vice-president — yet another politician to have played hurling in Croke Park. Xi is expected to become the new general secretary of the party at the congress, paving the way for him to become president in 2013. He will be taking over one of the most powerful jobs in the world but, unlike his American counterpart also being elected this week, we know very little about the dynamics of the election. Predictably, it has featured photo opportunities abroad, trumpeting of policy successes at home, and relentless campaigning. Nevertheless, the process is opaque. Probably, the most important thing about it is that it is happening at all. When many other one-party, autocratic states have witnessed violent and unpredictable regime change, the people’s republic will see one set of leaders step aside gracefully after ruling for 10 years to allow the next generation to take over. The history of China going back to imperial times has seldom seen such an orderly transition. Assuming the “mandate of heaven” has frequently been a gory business, but Xi Jinping and his generation of Chinese leaders have seen enough turmoil to value an orderly transition. While much is made of their status as “princelings”, the privileged offspring of former CCP champions, Xi and the others are also products of the Cultural Revolution, a time of anarchy and terror to match the French Revolution. Their parents were bullied, exiled, and even murdered in a period of political mayhem that still tutors their outlook. Control is important so competition must be managed to give the appearance of “harmony”, the CCP’s mantra under Hu Jintao the outgoing top man. The harmony is deceptive. There is room for ambitious political figures to fight their way up the political ladder. Factional politics is rife in China. The party likes to stress that it has a collective leadership nowadays. But the essential meaning of that term is a balance of factions. Ambitious individuals will have to ally with like-minded CCP members and appeal to powerful interests outside. Collective leadership implies infighting among factions, and hence policy decisions to some extent are made through collective efforts. The People’s Republic of China was founded in 1949 and its early leaders were feted for their part in the nation’s war of independence. Like Ireland in the 1960s, new politicians have come to the fore who were not directly involved in the struggle for freedom. Their ideological grounding is less communist and more pragmatic than that of the founders of the state though, like our own politicians, they have to be deferential to the rhetoric of “the dead generations”. Xi and his fellow leaders now have to appear both close to the people and competent at managing the government. Food safety, house prices, and job security must be watched carefully and blatant corruption tackled with public fervour. via Ireland and the presidential election… in China | Irish Examiner.